A little grey kitten is enjoying the summer flowers. 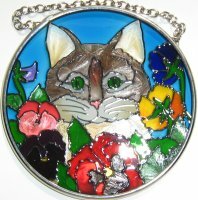 This art glass sun catcher is 3 3/8" in diameter. 100% lead free, chain for hanging.